As the American life blood, a good cup of coffee can make or break a person’s day. Always make sure your brew is fresh, and people will know that your business is a place they can rely on for that great cup of Joe. This is beneficial to your staff as well as the customer. A clean work space will allow your staff to serve customers more efficiently, as well as maintaining an aesthetically pleasing area to the customer. Giving your customers a variety of choices will encourage them to try more of your products, so make sure the assortment you offer is brewed to perfection. Having varied creams, milk, sugar, etc. available for coffee, and condiments for food items is crucial to your business. Keeping these consistently in stock will keep the customers coming in. Although this is a primary staple of good business, people will only respond to your promotions and benefits if you offer a good, reliable product. Apart from liability, keeping the walkway and entrance to your store clean and uninhibited plays a huge roll in whether someone will consider coming in to give you business. If it looks dirty or unsafe, they assume your products are comparable to that. Maintaining a good outside appearance to your store (as aforementioned in #6) will show customers that you take the time to keep a tidy store, which also translates to your quality products. Especially if you are going to be using your store windows for advertising, promotions and signage, make sure that the glass is always clean, and signs relevant to your current promotion/available products. Nothing says sub-par like a dimly lit establishment. Customers want to see bright, clean stores because it correlates with safe, clean products. If a bulb goes out, change it for a new one right away. These simple maintenance tips will undoubtedly add value to your store and let customers know that you have a clean, safe and quality establishment that they can count on for good service. In addition to these tips, always take into consideration feedback from customers. If a customer has a suggestion on how to better improve service, hear them out. Chances are, other customers feel the same way. Your number one job is to please the masses. Ready to elevate your store’s coffee supremacy? 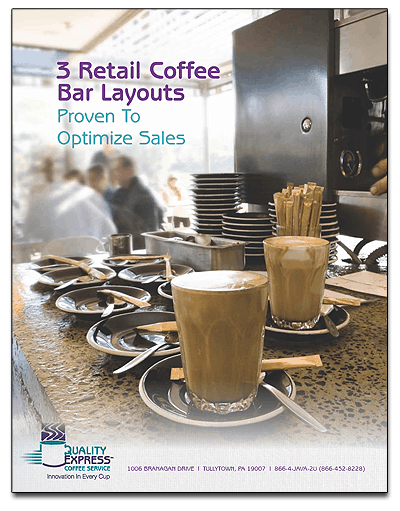 Download our custom coffee bar layouts or talk with a Java Genius today to get started.